Yes, it's official! The BFF of my teeny, puny, tiny little eyes is a pair of crease brushes. 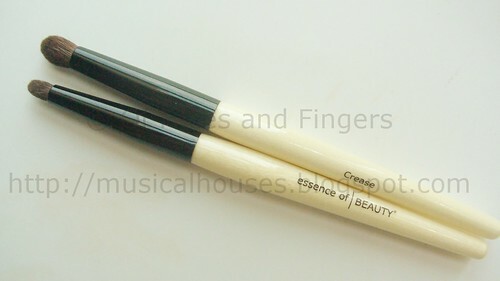 And it's none other than the famed Essence of Beauty Crease Brush Duo! I don't know why I took so long to buy myself a pair of these, but now that I finally have them, I have nothing but great things to say about them. In fact, I think I need to get a backup. Or two, or three, or four, or more! Both brushes have black ferrules and light handles, and both brushes are marked "Crease", which I think is kind of cute. These brushes are actually smaller than your average crease brush, which I think makes them perfect for small eyes which don't have much lid space. 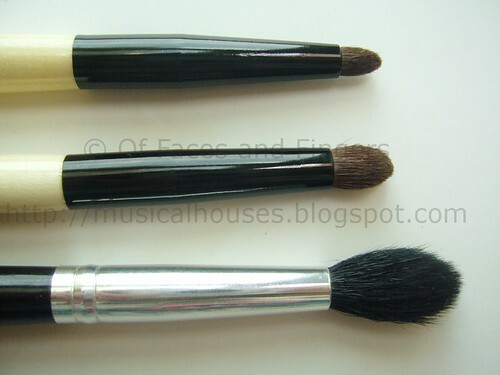 The larger of the two brushes is a domed brush for blending, while the smaller of the two brushes has tapered bristles resembling a pencil brush. The larger domed brush is great for blending out eyeshadow, while the smaller one is great for applying eyeshadow to tight areas, or applying eyeshadow as eyeliner, or even blending out very teeny tiny areas (like the corners of your eyes). The brushes themselves are made of natural hair. It's not particularly awesome quality natural hair, to be honest - the bristles are a little stiffer than some other brands that have good quality bristles (e.g. Stila). However, they're pretty good for the drugstore price, and definitely comfortable to use. They're just not, you know, THE best out there. But the quality of the bristles isn't what makes this duo so brilliant. It's the fact that the brush tips have a rounded shape, and that the bristle length and density are just perfect. The larger domed crease brush is one of my major loves right now - it has enough bristles to feel firm to the touch, allowing it to pick up and apply eyeshadow to the crease, and yet, the bristles aren't so tightly packed together that it makes blending difficult. The pencil brush is also the right length, allowing for bristle flexibility that still retains some brush firmness. Another thing I love about these two brushes is that they're small, so they fit very nicely into the contour area of my puny little eyes. I still love my Stila #9 All Over Blending Brush, but for small or tight spaces, when the Stila brush is too big, I find the EOB brushes give a more precise application that is still blended. It's much easier blending smaller areas of eyeshadow with the EOB brushes, as the smaller brush surface mean that the risk of overblending areas you don't wish to blend is lessened. Here are the brushes next to the Stila #9 for comparison. As you can see, they are a lot smaller, and the bristles are more tightly packed together. So do you need this? Of course you do! If you, like me, have small puny eyes, then you need this for blending colour in your contour or crease area. If you like to do precise work with your eyeshadow, and need a brush to blend out small areas of eyeshadow, then you need this. If you find the average blending brush too large, and wish for a smaller blending brush for your eye area, then you need this. I mean, what's not to like? It's cheap, it's good, and it works a treat. My eyes are totally in love with this brush duo. It's definitey worth a shot - and if you don't like it, send it my way, because I'm looking for backups! I first heard about these from Emilynoel83 & tracked them down when I was in the States in November...love them as well, great little brushes everyone should own! Hmm... you've got me thinking now that I'm using the wrong brushes! Sometimes I'm delusional and think that my eyes aren't that small (but they totally are). I need this duo in my life! Especially that larger domed brush. I always find blending brushes to be too flimsy for my liking, but this looks perfect. Hi. May I know where did you get this? Did you happen to get it in Singapore? Because I'm kind of desperate for this brush. Thankyou!!! @Anonymous: you can't get it in Singapore, I'm afraid. I had to get my friend in the US to send one over to me. Alternatively you could try EBay or other such online sites. Happy hunting! I got them too but in the new packaging. 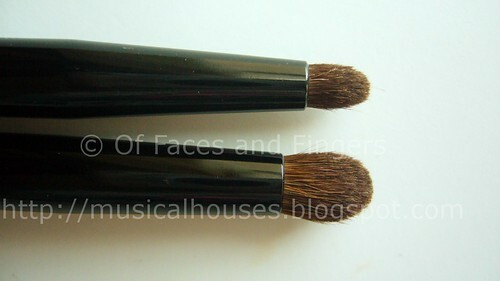 The larger crease brush is slightly sharper, but it is great for blending too! nice post! I'll def. check these crease duo out! is CVS the only place selling this ? I have this crease brush duo. I have rather large eyes, but nevertheless find that the larger brush works well for applying eyeshadow into the crease. I don't use the smaller one that much; just for applying eyeshadow to line the upper or lower lashline, really. Essence of Beauty is CVS's "store brand" of makeup brushes and accessories. While Essence of Beauty products still are sold at CVS, their makeup brushes are now under the brand name Beauty 360. Unfortunately, it seems like the crease brush duo, and a lot of their other brush sets, are discontinued! However, they can still be snagged on eBay.